Frank Dunn Williams is a son of Edward Heath Williams and Maude Dunn. 2. 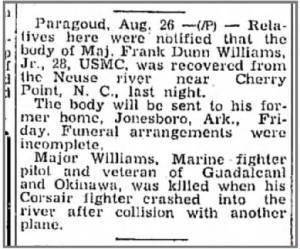 Frank Dunn Williams, Jr Major in USMC. Pilot killed during training in plane crash. Martha Ann Irwin the daughter of Frank D. Williams and Lenita Mason Williams was born in Jonesboro, Arkansas on March 13, 1923 and passed away at Conway, Arkansas on November 4, 2014 at the age of 91 years. Martha Ann was retired from Olin Corporation and she was a member of St. Albert Catholic Church in Heber Springs. She moved here from Little Rock and was an avid bridge player and loved crossword puzzles. She was preceded in death by her parents her husband's Jack J. Davis of Little Rock and Ed Henry Irwin of Heber Springs. Martha Ann was also preceded in death by three sisters Phyllis Williams Stringer, Juanita Williams Booker, and Joyce Williams, one brother Frank Dunn Williams. She is survived by a stepson, Mike Irwin and wife Evelyn of Heber Springs, two grandchildren, Thomas Irwin of Fenton, Missouri and Ross Irwin and wife Mary of Houston, Texas, a stepson, Jack K. Davis, three nieces and two nephews besides other relatives and many friends. A visitation will be held on Friday, November 7, 2014 at Family Funeral Service from 5 until 7 p.m. and a funeral mass will be held on Saturday, November 8, 2014 at 10 a.m. in St. Albert Catholic Church in Heber Springs, Interment will be in the Heber Springs Cemetery by Family Funeral Service. Ed Henry Irwin the son of Henry Clay Irwin and Bess Irwin Phillips was born in Heber Springs, Arkansas on June 20, 1929 and passed away in Little Rock, Arkansas on August 20, 2012 at the age of 83 years. Ed was the owner of Heber Hardware and Furniture which later became Irwin's Ace Hardware store in Heber Springs. 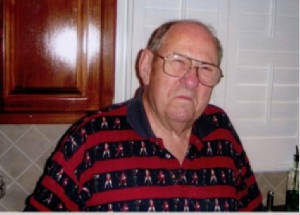 He was Past President of the Arkansas Hardware Association and Past President of the Heber Springs Rotary Club. He was a 32 Degree Mason and Past Master of the Lodge, a director with Arkansas National Bank in Heber Springs and greeter at Super Splash Car Wash in Heber Springs for the past 15 years. Ed was preceded in death by his wife Leta Jo Benbrook Irwin. He is survived by his wife Martha Ann Davis Irwin, Son Mike Irwin and wife Evelyn of Heber Springs and two grandsons Thomas Irwin of St. Louis, Missouri and Ross Irwin and wife Mary of Houston, Texas besides other relatives and many friends. A visitation will be held on Wednesday, August 22, 2012 from 5:00 until 7:00 PM at Family Funeral Service, 100 West Searcy Street, Heber Springs, AR and funeral services will be on Thursday, August 23 at 1:30 PM at the First United Methodist Church in Heber Springs with interment in the Heber Springs Cemetery. Officiating will be Rev. Tommy Toombs and pallbearers are Jim Robbins, Jon Robbins, Nevin Robbins, Sam Haile, Howard Cahpin, John Cook, Tommy Mays and Dwight Olmstead. Honorary Pallbearers are Art Dunn, Earnie Stark, Jack Duckworth, Tom Holland, Jerry Pilkington, Cecil Alexander and J. L. Mullens. 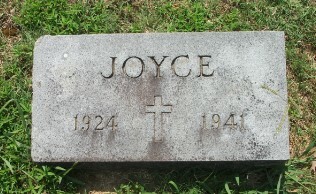 Died 4 Apr 1981 Jonesboro AR, one day after she was married. Frank D. Williams, aged 50, died Sunday afternoon at 5:40 at St. Bernard's Hospital. He had been quite ill for several months and hoped for his recovery was abandoned some time ago. Mr. Williams had operated the Williams Hardware Company since 1935. Before that he had been associated in the operation of the Jonesboro Hardware Company since 1917. He was born at Luxora but moved to Jonesboro as a child and had made his home here since that time. As a young man he was prominent as an athlete, playing on baseball and basketball teams and serving as an offi­cial at athletic contests on many occasions. He served in the U. S. Navy in World War One. Mr. Williams was a member of the Catholic Church, the Knights of Columbus, and the Elks Club. 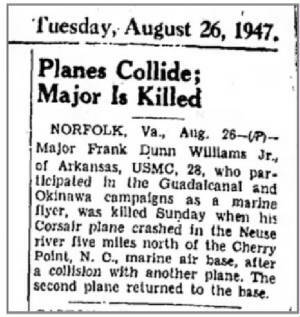 Survivors are his widow, the former Miss Lenita Mason; one son, Major Frank D. Williams of the U. S. Marine Corps; three daughters, Mrs. Dan Stringer, and Misses, Martha Ann and Juanita Williams; one sister, Mrs. Bernard Holthouse, Lawrenceburg, Tenn.; and a brother, Ed J. Williams, Roswell, N .M. Funeral services will be con­ducted at nine o'clock Tuesday morning; at the Blessed Sacrament Catholic Church with the Rev. 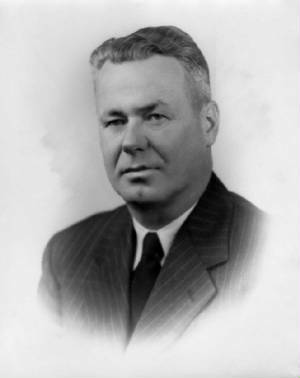 W. J. Kordsmeier in charge. Pallbearers will be, active: John Chambers, B. c. Hartin, Cecil Looney, Frank Dalhoff, Jos w. Gatz, W. M Davis, Brough Patterson, and Will Mack. Members of the Elks Club and the Knights of Columbus will be honorary pallbearers. The Rosary service will be conducted at the Gregg Funeral Home at 7:30 this evening.